Thales Defense & Security, Inc. has been awarded an Indefinite Delivery/Indefinite Quantity (IDIQ) contract by the U.S. Army for its Soldier Radio Waveform Appliqué (SRW-A) radio system, the AN/VRC-121 Vehicle Integrated Power Enhanced Rifleman, or VIPER. Developed jointly with Ultralife Corporation’s Communications Systems business, VIPER responds to the U.S. Army’s requirement for a single channel, vehicle mounted radio running SRW that can be installed into the Single Channel Ground and Airborne Radio System (SINCGARS) Combat Net Radio (CNR) vehicular mount or used in a stand-alone configuration. 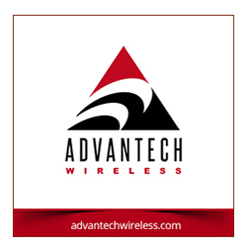 The radio system provides an independent or second channel solution for vehicle communications installations, acting as a conduit for voice and data between the dismounted soldier, mounted platforms, the Unit, and higher headquarters. VIPER provides soldiers with access to the government’s classified networks for Secret and below operations. 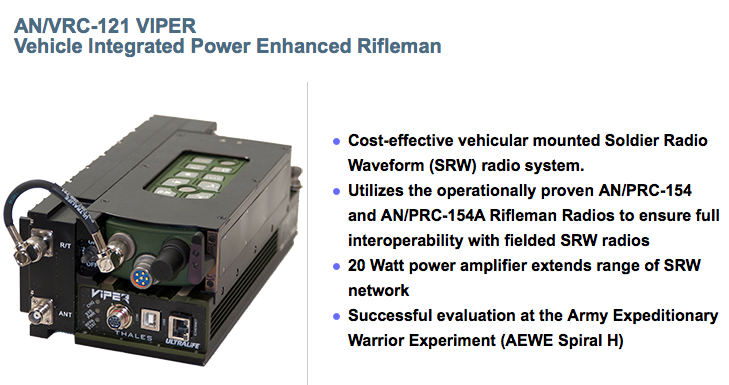 VIPER integrates, and interacts seamlessly, with an installed AN/PRC-154A Rifleman Radio. The Rifleman Radio, which was co-developed, and is being co-manufactured, by Thales and General Dynamics C4 Systems under the Joint Tactical Radio System Handheld, Manpack, and Small Form Fit program of record, has been fully tested, certified, and deployed. With more than 19,000 Rifleman Radios manufactured, the VIPER solution ensures that the U.S. Army has immediate interoperability with currently fielded radios, while soldiers gain greater operational flexibility due to its ability to operate in both UHF and Lbands. VIPER provides "Jerk and Run" access to the installed Rifleman Radio, enabling a quick transition between mounted and dismounted operations without losing communications. The basic IDIQ contract, awarded to four companies, allows the companies to compete on future orders to support fielding requirements. The total potential IDIQ contract value is $988 Million. The initial contract award is for engineering and field service support to evaluate the SRW, a capability during the U.S. Army’s Network Integration Evaluation (NIE) 14.2 in May 2014. Learn more about this and other Thales' products at. Thales’ VIPER and Rifleman Radio products are manufactured at the company’s Clarksburg, Maryland, facilities.